Unlocking Pandora's Box: they click their heels, spread their wings, and fly. In one of my previous posts,"once you label me, you negate me", I talked about how the media is still filled with a lot of negative sexism. For example, women are overtly sexualised in order to sell products, and models are often airbrushed to look perfect on the front cover of a magazine. However I mentioned that there are some incredibly strong female characters in fiction. Yet re-reading that post, I realised that I only talked about characters in television shows. There are some amazing, incredibly strong female characters in literature, and it is time to recognise them. I've put together a list of seven of the most powerful female characters in literature who continue to inspire me and several others with their phenomenal brilliance and strength of character. Screenshot from Joss Whedon's 'Much Ado About Nothing'. Left is Beatrice, right is Hero. If you have been reading this blog for a while now, you will know that Much Ado About Nothing is my favourite play ever. We read it in Year 10 at school and most of us ended up loving the play. Recently, Joss Whedon released a new movie adaptation of it. If you haven't seen the film, I highly recommend it. Who doesn’t love a story full of love, trickery and thousands of clever insults? Much Ado has all of that and more – and that might just be why we love it so much. But part of the reason that the play appeals so greatly to the modern audience lies in the characters. Beatrice, the female lead is widely considered to be one of Shakespeare’s strongest female characters. (she certainly is the sassiest). Much to the chagrin of her father, she refuses to marry, having not found the perfect man, and also because she does not want to eschew her freedom. When Claudio falsely accuses Hero at the wedding in Act 4 Scene 1, Beatrice explodes with anger and stands firmly by her cousins' side. After this event, she rebels against the mistreatment and unequal status of women in the society at that time. One of my favourite Beatrice lines is "oh that I were a man! I would eat his heart in the marketplace!" 2. Hermione Granger, the Harry Potter series. If you have not read Harry Potter, you have not lived. Ever since I first read the books several years ago, I have always loved Hermione's character. Sure, she may have started out as an irritating, know-it-all, eleven-year-old (it''s leviosa, not leviosar), but Hermione's character quickly matured. She continues to amaze us with her ability to maintain a clear mind, even in the most tense of situations. Her intelligence is her greatest strength, and although she can be a bit of an overachiever at times (like when she got an 'Exceeds Expectations' in her Defense Against the Dark Arts O.W.L. and was upset about it), she always manages to use her knowledge to save her friends. Not only is this powerful female protagonist an incredible computer hacker with a photographic memory, she also survived an abusive childhood. She’s a resilient character, who does not rely on anyone for anything and does not want to rely on anyone. 4. Skeeter Phelan, The Help. Actually, almost every female character from The Help, with the exception of Miss Elizabeth and Miss Hilly Holbrook, is seriously strong. They should all be on this list. But Skeeter stands out to me, because of the risks she takes by writing The Help. She wants to make a difference and she doesn't care what other people are going to think of her. Plus, she's independent- she thinks for herself, and makes her own decisions. She even goes to college, even though her mother is sure that it will ruin her chances of getting a good husband. Because, obviously, a man wouldn't want to marry a woman who is smarter than him. 5. Kira Walker, the Partials trilogy. Partials is a relatively new series- the first book came out last year, and the second book came out in March. If you haven't read it yet (and a lot of people haven't), then you should. The book is set 11 years after the Partial War, in which engineered organic beings identical to humans released a virus called RM that decimated almost the entire human race. A group of survivors have regrouped on Long Island, while the Partials have mysteriously retreated. However, the survivors cannot have children, as no child born is immune to RM, and they have yet to find a cure. Kira is a medical intern, and when her best friend Madison falls pregnant, she decides that she has to find a cure for RM, no matter what it takes so that Maddie's baby survives. This includes a series of very dangerous, illegal journeys to find a Partial to study. Her determination and loyalty to her friends is admirable, and she's not afraid to break the rules to do something that she knows is right. Throughout the course of the series, she uncovers some shocking secrets about herself and those around her. She will go great lengths to find out the truth. 6. 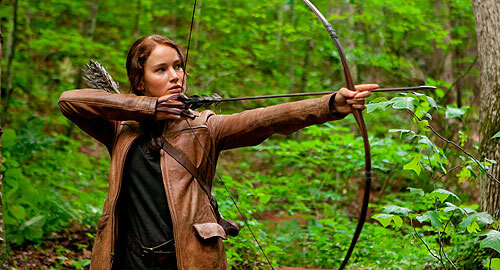 Katniss Everdeen, the Hunger Games. Katniss is a pretty strong character overall. After her father's death, she becomes the sole caretaker of her family, hunting in the forest at the back of District 12, and trading food on the black market. She is brave enough to volunteer to take her sister's place in the Hunger Games- something that must have frightened her to no end, considering that she knew that she would either have to kill others or die. Plus, her ability to shoot an arrow doesn’t hurt. Although Cassandra has a very small role in the play as a whole, she is very important. She is the first to recall the past crimes committed in the house of Atreus. Furthermore, she is the one who sets the scene for the end of Agamemnon, as well as the next play in the Orestia, Libation Bearers. She does this by foreseeing her own death, and Agamemnon’s death, as well as the vengeance that Agamemnon’s son, Orestes will take against Clytmnestra. Cassandra has the ability to see the future, but has been cursed by Apollo so that no one will believe her. She foresaw the fall of Troy and the death of those around her, but was unable to do anything about it because people believed that she was crazy. Her gift caused her endless anger and frustration. When she was brought to Argos by Agamemnon, she saw her own death. Although shaken and scared, she understood that she could not escape it, and summoned all of her strength to face death bravely. So there you have it. If there's a character that you really admire who hasn't been mentioned here, please add her on in the comments! As Stana Katic said: "I don't believe in weak women. I think women in general are pretty powerful." I love this post - Beatrice really isn't given enough credit, and Joss Whedon's version of Much Ado was so good! I might have to watch that 'Much Ado' because it sounds pretty interesting. Nice post, I know this girl is from a film and not necessarily from a book but I really like Kat Stratford from 10 things I hate about you. She's such a strong/independant character- In my opinion anyway haha! Thank you for the darling comment on my blog! I'm definitely a huge Hermione and Cassandra fan anyway, I agree with you, literature is full of independent-minded, strong willed and intelligent female characters, they deserve a lot more recognition! You recently followed me so thank you very much for that! I checked out the link you left to your blog and I love it! I am now following you! I mean, real-live fact. If you haven't read Harry you haven't lived. Just a fact of life. Hermione and Katniss influence so many of my female protagonists. They're some of my favorites, too. :) (Along with Alanna, Kel, Beka, and any of the other female characters created by Tamora Pierce). Hi, i realise this is a rather late comment on your post, but i just wanted to tell you that I thought this was a great post. As someone who reads a lot, I was delighted to find some of my favorite books/plays in this list. Another female character I like a lot is Elizabeth from "Pride and Prejudice", I don´t know if you have read it? Hello lovely anon, don't worry about it! I have read 'Pride and Prejudice' and Elizabeth's a great character. She should actually be on this list!